Available in a 32oz. bottle, PureGreen24 is a colorless, odorless broad spectrum antimicrobial disinfectant and a deodorizer. Proven to kill viruses in: Homes, Hotels, Airplanes, Ships, Exercise Facilities, Restaurants, Medical Facilities, Veterinary Facilities, Schools, Offices, Day Care Facilities, and other Public Facilities and Transportation. 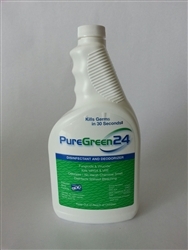 PureGreen24 has been formulated to disinfect hard, non-porous environmental surfaces (painted, glazed tile, plastic, metal, glass, and glazed porcelain), and surfaces in bathrooms, kitchens, and more (counters, sinks, appliances, walls, floors, cabinets, tubs, showers, telephones, exam tables, play tables, toys, changing tables, jungle gyms, strollers, cribs, and playpens). Fast, easy, and effective; kills germs in 30 seconds.